We had the following problem at work that was causing lot of trouble and stress, sometimes, apparently out of nowhere back-end response times started to grow on every request until they reached the timeout value and all requests started to fail with a 504 response code causing chaos, mayhem and management complaints. Here are the analysis of the situation, the measurements taken and the results. The application was conformed of several AWS t3 instances using Nginx for serving a PHP application making use of PHP-FPM. Clients, represented as the computer on the black circle, were making REST calls to on Application Load Balancer and this component would route the request to any of the t3 instances situated in the Target Group. The instance would then receive the request, process it and then finally return the result. The problem of all requests timing out continued repeating over time with no apparent reason and solutions like increasing the back-end instances size and number seemed not to help, also all the instances on the Target Group were reported as healthy so the ALB was routing requests to them even that all their requests were timing out. Individually analyzing the code for each request involved in the incident was no help either because we had all kinds of them requesting all kind of actions, the only conclusion that could be gotten from analyzing the incoming traffic is that it seemed to be a certain correlation with high traffic bursts but these were not always present when the problem appeared. The first step for analyzing an emergency situation like this should be always a good information gathering process. We needed to take a look on all the sources of information we could get, whether this is data coming from the components causing the trouble or information on how the components actually work from their documentation. So we could start from the most apparent symptom, the timing out of the requests. To understand why a timeout can occur, you need to know first how a request is passed from one component to another. In this particular case, the first component to receive the request is the ALB. 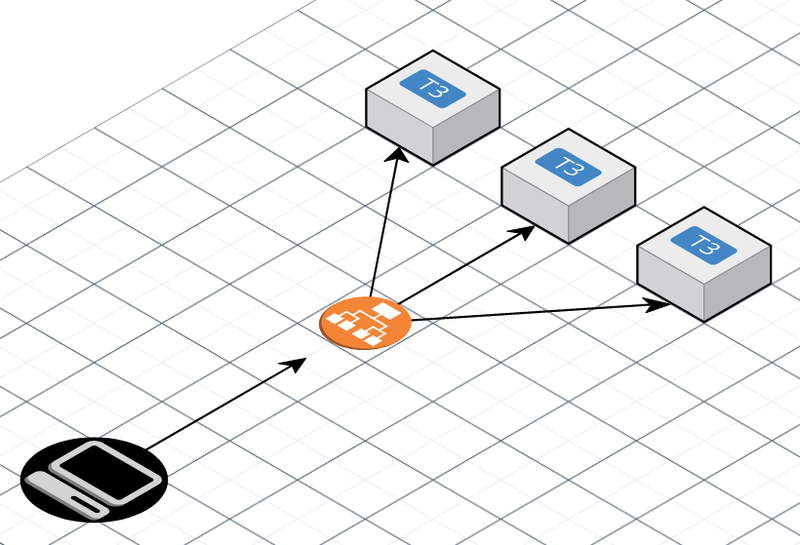 AWS Application Load Balancers come with a configuration parameter called idle timeout. The Load Balancer passes the request to the next component and waits for a response, this is the maximum time it will wait for the components underneath to respond, if this times passes and no response has been received it will directly inform the client making the requests that its request has timed out. If we continue to the next component, then we get to the instance. As mentioned, the instance is running Nginx so this is the software that will deal with the request. It has a configuration directive called keepalive_timeout Nginx will close connections with the client after this period of time. Going deeper, Nginx passes the request to PHP-FPM using the fastcgi directives. Now that it's PHP-FPM the one that has the request and can also timeout the request based on the value of the option request_terminate_timeout from the pool configuration i. e. /etc/php/7.2/fpm/pool.d/www.conf, this option comes disabled by default. Finally PHP also comes with its own timeout configuration parameter called max_execution_time placed on etc/php/7.2/fpm/php.ini. So the chain of possible timeouts goes like this, I like to imagine like a set of scissors placed one after another, the scissors are moving down and all of them start from a distance of the thread that represents the request. Timing out a request because PHP's max_execution_time is reached will leave a message like the following on the Nginx error log i.e. /var/log/nginx/error.log but nothing on the PHP-FPM log. 2019/03/26 20:05:05 [error] 9674#9674: *134 FastCGI sent in stderr: "PHP message: PHP Fatal error: Maximum execution time of 20 seconds exceeded in /var/www/html/index.php on line 4" while reading response header from upstream, client: 134.27.35.127, server: test.namelivia.server, request: "GET / HTTP/1.1", upstream: "fastcgi://unix:/var/run/php/php7.2-fpm.sock:", host: "poc.e-valua.es"
And finally, if it's the ALB the one that closes the connection, there may not be any messages logged on the instance because it may even keep doing it's processing when the ALB has already discarded the request. WARNING: [pool www] server reached pm.max_children setting (5), consider raising it. As this is pointing to PHP-FPM process manager configuration the next step was to force some resource depletion scenarios. To configure the process manager I played with the parameters like pm, max_children, start_servers, min_spare_servers, max_spare_servers and process_idle_timeout. I tested different configurations and made some stress tests where I could exactly replicate what was happening in the production server. When having PHP-FPM's pm set to dynamic while the max_children parameter and spare_servers set to 1 I could then start performing concurrent requests that would take several seconds to be fulfilled. On a PHP resource depletion scenario the requests started to queue and its processing time would exponentially grow until reaching timeout values. Here is a comparison of the behavior a few requests in both scenarios. 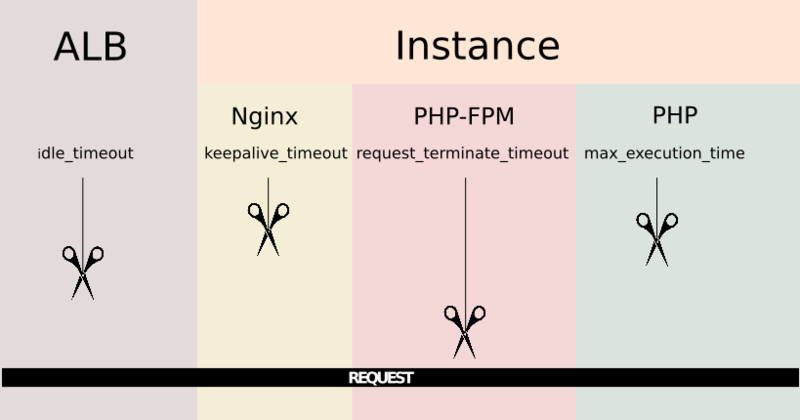 The reason for this is that PHP-FPM has some "slots" defined for dealing with incoming requests, once a request occupies the slot then the next request will go into the next available slot. If all these slots are full the warning mentioned above will be printed on the log and the request will wait for the next free slot to be processed, all this waiting time is also time that counts for the request to timeout so if requests are arriving at a faster pace than they are leaving the will start to enqueue indefinetly and that's the exact cause that was bringing down our systems. The very first measurement then for avoiding this was tuning the PHP-FPM pm configurations on the EC2 production instances. There are many ways for doing this and I read quite a lot of good articles on the topic. 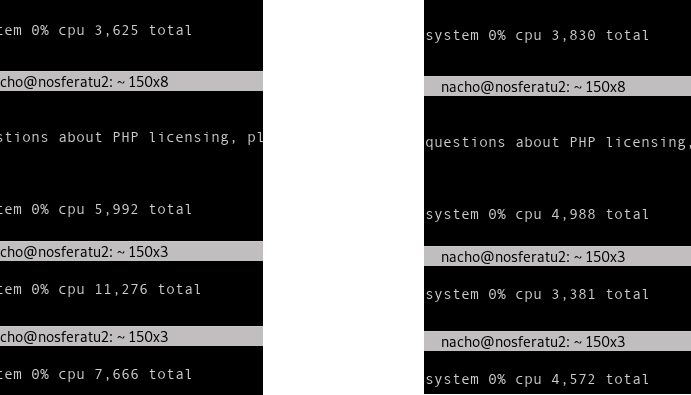 Finally I decided setting an static pm management mode adjusted to the instances available RAM and the average process size. I also added some free memory graphs and alerts on Amazon Cloudwatch so I could graphically see and monitor how memory consumption was varying and how much free memory was left. I also decided to set max_requests parameters to avoid memory leaks, this parameter will make PHP-FPM to restart after a number of requests managed in case it is degraded, this seemed convenient. By enabling the status page we can also get valuable information on how PHP-FPM process management is doing, I leave for a future research a way to link this information to Amazon Cloudwatch metrics because this could be really nice and useful. It is worth to mention that the php7.2-fpm service needs to be restarted in order to apply changes. Now after checking the state the machines are booted and setup in we can safely create and destroy new instances and redirect our client traffic there safely. The purpose here was to reacting accordingly and reasonably to an unexpected state of the service. By strictly following the steps of information gathering and documentation reading we obtained information to identify the bottleneck, then performed a proof of concept to ensure the problem's origin, design and implement a solution and ultimately fix it permanently by automating the solution into a chef recipe. This also helped us learning more and achieving a better understanding on how PHP, PHP-FPM, AWS and Nginx works.